In March of 2015, I heard about a stable near my home called Heritage Stables. 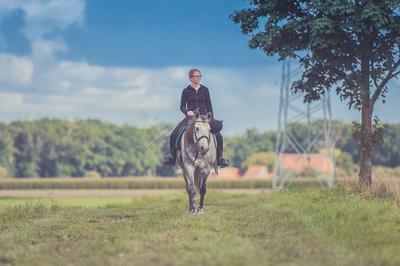 I had loved horses for about three years and had been wanting to ride ever since. Finally, I convinced my parents to let me join the 4h horse club they offered which did monthly riding clinics. On the very first clinic, I was placed in a beginner group with my two really close friends. I met Peppy, a spirited black and white paint gelding. I learned how to lead, groom, tack up, ride and untack and hose him down. My first year of riding was a tough time for me as I could only ride once a month. The next clinic, I rode a bay thoroughbred gelding named Heart. I learned the basics at the walk. I then signed up for a day riding camp at the barn. I rode a flea bitten grey thoroughbred gelding named Riley. This was the day I learned to trot and had my first trail ride. Then finally, after months without riding Peppy, I rode him in our annual Gymkhana! I had so much fun! There were only three clinics left in the year. In the next clinic, I rode Riley. Then, after what seemed like forever, I rode Peppy in our barn show. I got two first places, some seconds, a third and a fourth place. Then the last clinic came which was sad for me. I rode Elvis, a naughty little paint horse gelding. This was the first time I actually got the posting trot and began to learn jumping position. After a four-month break from riding , I had officially saved up enough money to take riding lessons twice a month. The first three lessons, I rode Elvis. I learned to post better and learned diagonals and also learned how to tack up on my own. In the fourth lesson, things began looking up. I rode Peppy for the first time in six months. After that, I rode him in every lesson. I mastered the trot and even began jumping teensy tiny cross rails. In Septemeber 2016, I began to canter. I only had enough money to take lessons through October. I rode Peppy in almost every lesson and clinic. At the barn horse show, I won 5 first places, 3 seconds and 1 third on him. We were bonding strongly and I loved him more than anything. Right when I thought I wouldn't see him for 4 months, I got an offer to watch my neighbor's dog and I saved enough money to ride once a month during the winter. I began cantering off the lunge line and going over small jumps in February. In March, I began jumping even higher. Now I jump 18 inches and am doing good with the canter. Peppy and I have bonded very closely. I am now starting lessons once a week until October! I cannot wait to see what the rest of 2017 brings! What is your Riding Story? Share in comments!